Region: This caterpillar is found in eastern North America. Life cycle: This insect produces two to three generations each year. Overwintering is done in the pupal stage in trash under trees, and the moths appear in the spring. Physical Description: This 3/4 inch long, slender caterpillar is light green with yellow marks on the thorax and head. The adult moth is white and has a red band on the fore wings. The wingspan of this moth is 1/2 an inch. The eggs are yellow and are laid on the bark, fruit, or foliage of plants in large overlapping groups. Feeding characteristics: This pest attacks hemlock, most vegetables, and fruit, especially the apple. The caterpillar or larvae feeds on the leaves early in the season and spins fine webs. Later in the season, they attack the fruits by chewing patches in the surface. Controls: If only a few plants are affected, the infested parts can be pinched off and destroyed. 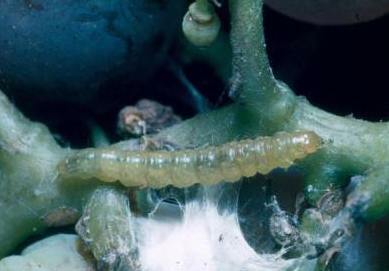 The Trichogramma Wasp and other parasitic insects are predators of this caterpillar and can help in controlling the problem. For serious infestations, dust plants with a mixture of equal parts of tobacco dust and pyrethrum or rotenone can be used. Apply twice, 30 minutes apart. The first drives them out the second kill them. An application of Bacillus thuringiensis can also be used for serious problems.